Cultural heritage, rock monastries in Bulgaria. The area has a unique combination of natural and cultural value. 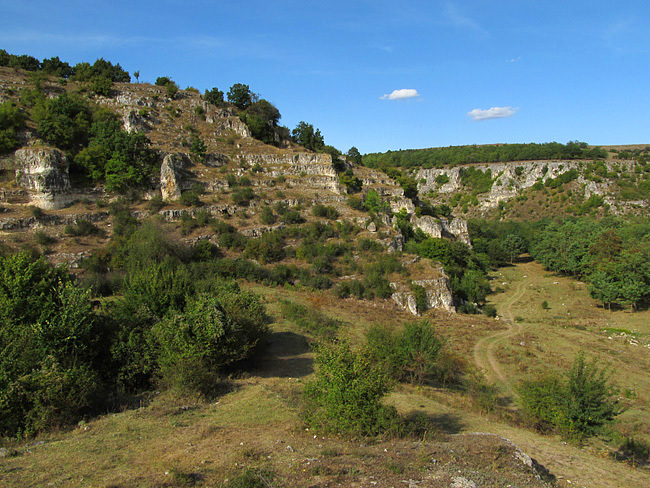 In addition to the rich wildlife in the area, visitors can also enjoy views to some of the oldest rock monastries in Europe from the V-VI century. Some of these can be reached by car or cycling from the cottage. Their location is marked on a map which we are happy to provide. It is the biggest Bizantium rock monastry from the early ages in Bulgaria and dates back to V-VI century. It is situated on the east bank of Suha reka at three levels. Includes a church, chapel, a place for abbots (no English word for that), and a large bedroom in the rock. The central part where the church is situated is carefully carved with naos (shrine) in quadrat shape 3.10 m long and 1.90m high. On the east wall is shaped an altar with three-parts. A corridor leads to a large bedroom in the rock where a well for water is situated. The church has an entrance part in quadrate shape and next to it is a chappel with rectangular apse. North of the chapel is the dining room and the place for abbots. Several scripts were found to suggest that the monastery is re used in X century. North of the monastery are situated two remote hermit cells and a church-tomb "Sandaklar maara" where monks were buried. It is situated on the east bank of Suha reka and about 300 m west of the church-tomb "Sandaklar maara". It has two floors with four rooms which date back to V-Vi century. At the lower floor at two levels are situated a cell and a chapel 2.60 Х 2.65 м with a niche on its east wall. A tomb chamber is carved next to the northern wall. The upper floor also includes a cell and a chappel. The chapel has a rectangular shape 2.50 Х 1.95m in size. On the eastern wall is situated the altar with an arc niche and by the northern wall is carved a bench and a tomb chamber. From the chapel, a narrow path leads to a triangle cell 2.90 Х 1.65 m in size. Evidence from scripts and several crosses with branching out ends suggest that this monastery is also reused in the X century. It is situated at the foot of a fortress from the early Bizantium and Middle Ages time. It includes a tomb chapel and a commom bedroom done in V-Vi century. The church is with a big naos (shrine) 3.20 / 4.80 m with a proper apse on the eastern wall and a large entrance area. There is a well for water which reaches the river. South of the church is the monk's bedroom 11.60 m long and 4.00 wide. There are several chambers on the walls and a rock toilet on the northern end. North of the church is a tomb chapel 4,40 m long and 7,30 m long. On the eastern wall is shaped an altar niche and in the floor are dug several tomb cells. A narrow corridor along a path dug in the rock leads to several cells in the northern part of the church. Right over a large natural cave on the western bank of Suha reka is carefully carved a three part rock church with an entrance area from the V-VI century. The Naos (shrine) is nearly with quadrate shape 3.50 Х 3.40 m. Niches called concha in latin are semi oval 2.00m wide. There used to be a small cell 2.00 Х 1.55 m south of the church. The cell is divided by the church by a corridor and there is a rectangular shape carved in the rock for icons. According to paintings and signs, the church is reused in X century. Photos from some of the rock monasteries can be seen here. General description with more images of the rock monasteries can be found here. The website here describes rock monateries further North West of Ognianovo, including a video found here.